Padraig O'Gorman Wexford County Council, Cllr George Lawlor Mayor of Wexford, Minister Brendan Howlin, Madeleine Quirke CEO Wexford Chamber, Martin Doyle President Wexford Chamber, Ian Talbot CEO Chambers Ireland and Karl Fitzpatrick Wexford Chamber at the Wexford Business Expo in Whites Hotel. Minister Brendan Howlin enjoying a cupcake with Yvonne Rath at the Wexford Business Expo in Whites Hotel. Cllr George Lawlor, Wendy O'Rourke, Minister Brendan Howlin, John O'Rourke and Martin Doyle at the Wexford Business Expo in Whites Hotel. Olive Doyle of Community Developement and Minister Brendan Howlin at the Wexford Business Expo in Whites Hotel. 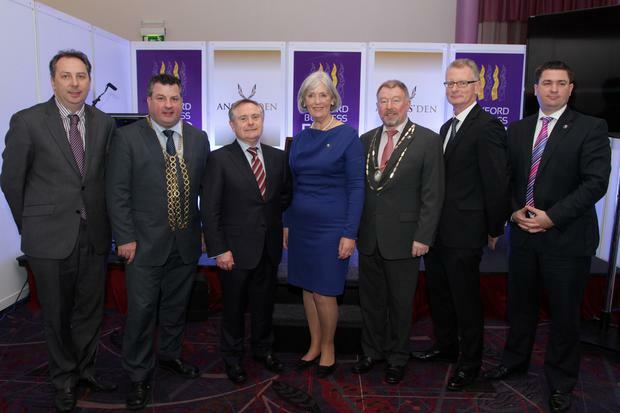 Martin Doyle, President Wexford Chamber; Darragh Clifford, Commissioning Editor, INM Regionals; Esther Hayden, wexfordpeople.ie; Minister Brendan Howlin and Cllr George Lawlor Mayor of Wexfordat the Wexford Business Expo in Whites Hotel. Phil Murphy, Caroline Godkin and Mary Bowie at the Wexford Business Expo in Whites Hotel. Minister Brendan Howlin with Jeanette Davis, Caroline Murphy and Janet Lambert of Wexford Campus at the Wexford Business Expo in Whites Hotel. Jo Denby, Michale Halpin and Catriona Murphy at the Wexford Business Expo in Whites Hotel. Claire Howlin, Ann Marie Stuart, Claire Porter Stuart and Mary O'Hanlon at the Wexford Business Expo in Whites Hotel. .Rachel Murphy of Liquid Glass and Minister Brendan Howlin and Martin Doyle at the Wexford Business Expo in Whites Hotel. James Reck and Joe Moore VW Wexford, Minister Brendan Howlin and Karl Fitzpatrick at the Wexford Business Expo in Whites Hotel. .Niamh Coman, Mary O'Dowd, Chris Culleton and Caroline Boggan at the Wexford Business Expo in Whites Hotel. Cat Hogan, Tony Clarke and Sabia Barron at the Wexford Business Expo in Whites Hotel. Madeleine Quirke, CEO Wexford Chamber at the Wexford Business Expo in Whites Hotel. Niamh Hogan and Breege Cosgrave at the Wexford Business Expo in Whites Hotel. Ian Talbot, CEO Chambers Ireland, speaking at the Wexford Business Expo in Whites Hotel. Martin Doyle, President Wexford Chamber, Jim O'Shea AIB, Paul Cleere AIB and Minister Brendan Howlin at the Wexford Business Expo in Whites Hotel. Martin Doyle, President, Wexford Chamber at the Wexford Business Expo in Whites Hotel. Minister Brendan Howlin giving his speech at the Wexford Business Expo in Whites Hotel.